Mutual aid and benevolent societies were found all over the Lothians and Fife by 1850. There were many in each parish, town or area of the city of Edinburgh. The sector was complicated and societies changed as new ideas replaced the old. Some societies adapted and were long lived. Many small societies lasted only a few years. The old trades incorporations lost most of their rights in the 1840s. Most of them faded away after that except in Edinburgh where they were sustained by their traditions and financial strength. Fraternities and other local friendly societies had more competition from new organisations. 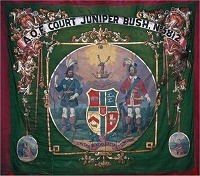 The Independent Order of Oddfellows (Manchester Unity) and the Ancient Order of Foresters were the first of these 'affiliated friendly societies' to open lodges in the area. Other affiliated friendly opened branches. Different societies attracted different sectors of the population. But, clusters of branches show that this was not always so. Affiliated societies had their own problems. Four Orders of Oddfellows competed for members around 1910. On order could split after arguments about the way it was run or the level of contributions and benefit. Sometimes a lodge might move from one order to another. Other lodges shared a name but had completely different affiliations. A lot of information about friendly societies has survived. Even more has not. It is hard to discover members and their place in the society. It is difficult to relate any society and its members to their community. Sometimes, all there is are names yearly registers or a few paragraphs in a newspaper. Printed rules and regulations will usually be preserved. The archive of the Registrar of Friendly Societies has many. Sometimes a history of a society was attempted and has survived. In a very few cases a run of minute books, accounts and other business papers will have survived. However, the work of interpreting the records has rarely been attempted. There is a wealth of financial, social and even genealogical information to be discovered. The resources assembled for this project can be used to examine the friendly societies in many towns across the Lothians and Fife. Friendly societies in Haddington, the county and market town of East Lothian, had a vibrant presence for nearly three hundred years. There is a lot more information assembled in the SHELF Project. The 6,600 resources digitised only sample local collections and this site highlights only a few of these. The resources are collected together on Resources for Learning in Scotland.